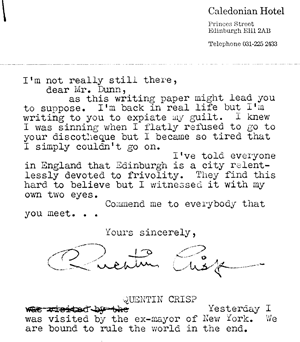 Letter to Quentin Crisp from Ian Dunn. Dated only Saturday 11th. Which month and year? Foolscap. "I'm not really still there, dear Mr. Dunn, as this writing paper might lead you to suppost. I'm back in real life but I'm writing to you to expiate my guilt. I knew I was sinning when I flatly refused to go to your discotheque but I became so tired that I simply couldn't go on. I've told everyone in England that Edinburgh is a city relentlessly devoted to frivolity. They find this hard to believe but I witnessed it with my own two eyes. 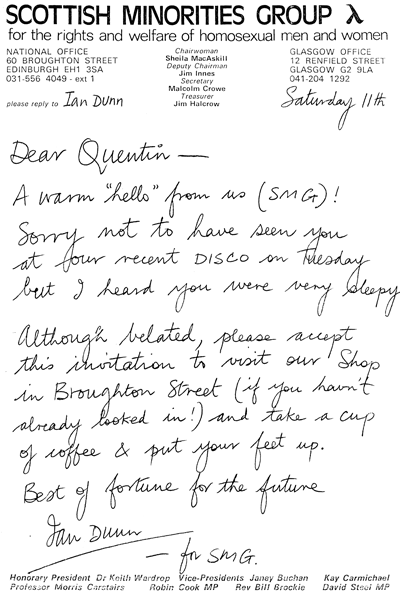 Yours sincerely, [signed] Quentin Crisp. Yesterday I was visited by the ex-mayor of New York. We are bound to rule the world in the end."